"I find it interesting how stars are born/die. It is cool how they can be born at the same time but evolve at different rates." "That stars need to 'consume' hydrogen to survive--that was really cool." "That the lifetime of low-mass stars is so huge that there is no observed instance of their death, this just further blows my mind." "That the SmartCar and Hummer had the exact same miles (and that they discontinued the Hummer H2)." "I liked learning about the SmartCar and Hummer situation because it put gas tanks and fuel efficiency into perspective for me." "How low-mass stars have larger hydrogen reserves than medium-mass stars, and that's why they can run longer...well, and they are also very conservative with their fusion." "The types of supernovas, the part that I find more interesting about the supernovas are the remnants." "That there are two different possible endings for a massive star." "The w(hole!) section on black holes--it's interesting that we know they exist, yet we can't even see them?" "That black holes cannot be seen but are detected by looking at nearby stars, distorted space-time and their gravitational effect." "Ages of star clusters. Not getting the connections as to how to age them." "All the different star stages, and the explosions section. Also, is it really true that no low-mass stars have died yet? This is confusing and I don't understand--if none have died yet, then how long does it take?" "The idea of a type II supernova core implosion-explosion. I just find it a little tricky to grasp that something that is running out of energy could be able to cause it to implode and give off such an explosion." "Novas and supernovas--I just don't understand how they are supposed to work." "Just trying to remember all the different stages of the life cycles of stars." "The pulsar lighthouse model is iffy for me. I think I get it, but I couldn't explain it to someone...so not really." "Black holes and why do they have to exist?" "The concept of a black hole is confusing all together :( It is just hard to wrap my head around." "I found most about the black hole confusing and misleading. What are black holes for? How were they formed? Are they forever? Can we get rid of them?" "The Hummer H2 has the ability to carry more gallons of gas compare to the SmartCar ForTwo but does have a worse gas mileage when being compared. Both of these attributes end up cancelling each other out." "A Hummer H2 has a huge gas tank, however it also guzzles gas tremendously while the SmartCar compensates its smaller tank by chugging less gas." "The Smartcar has a better mpg than the Hummer so it doesn't need as big of a fuel tank; but since the Hummer has a lower mpg it has/needs a bigger fuel tank than the Smartcar to go the same distance." "The Hummer has a large fuel tank but it burns its fuel really quick. The SmartCar has little fuel tank but burns its really slowly." 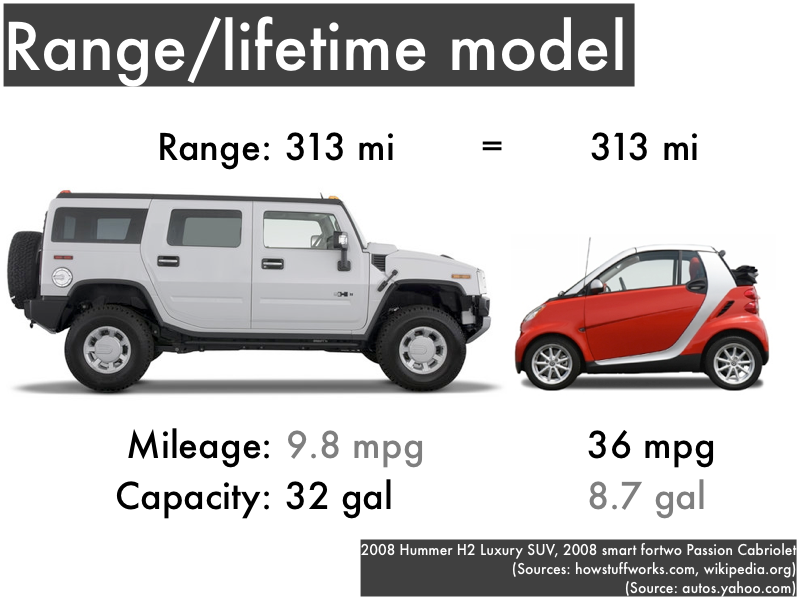 "The Hummer has more fuel to begin with and, the SmartCar has less. However, the SmartCar uses the fuel more efficiently than the Hummer." "Look at the sky with wonder and curiosity." "To think Pluto is a planet." "Don't confuse it with astrology?" "Attend class and don't procrastinate?" "Come to class, for sure?" "I have no idea, and I'm so confused because I feel like I'm clearly missing something obvious." "You do not talk about astronomy class." "What is the actual first rule of astronomy?" "Please go over black holes."